I'm not quite sure why I'm so taken with the fact that Betty White's birthday cake was baked by Betty Crocker, but I am. Maybe because Betty Crocker was first created in 1921, and Betty White was born in 1922 so they are both enduring ladies. Or maybe just because I grew up with both. 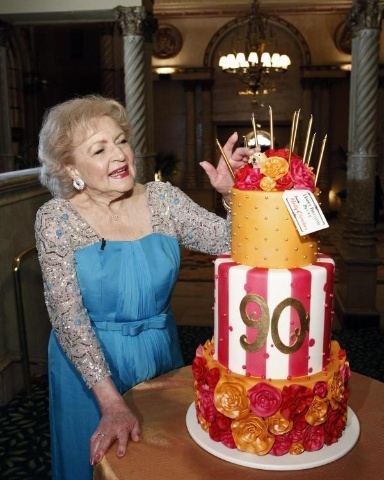 Whatever, here's a picture of the cake with Betty White. According to the press info, the three-tiered Triple Chocolate Celebration Cake, flown by private plane from Betty Crocker’s Minneapolis home to Los Angeles for Betty White’s birthday, is a decadent chocolate cake layered with sumptuous chocolate mousse and rich chocolate ganache. Marrying classic and modern elements, the red, orange and magenta cake is decorated with dozens of fondant roses, shimmery edible pearls and golden candles – and hidden among the roses – a small replica of Betty’s beloved dog Pontiac.